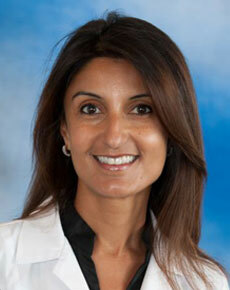 Dr. Parineet Bambrah specializes in the specialty of Physical Medicine & Rehabilitation . She began seeing patients with The Orthopaedic & Sports Medicine Center in the summer of 2004. She obtained her medical degree from SABA University in the Netherlands, Antilles in 1999. An internship in preliminary internal medicine was completed at the Good Samaritan Hospital in Cincinnati Ohio, followed by residency training in physical medicine and rehabilitation at Georgetown University and the National Rehabilitation Hospital in Washington, DC. Dr. Bambrah is Board Certified with The American Board of Physical Medicine & Rehabilitation. Her focus is Non-Operative Spine Management and she regularly conducts EMG studies each week in her office in Annapolis. Dr. Bambrah was born in Connecticut and completed her pre-med studies at Wesleyan University where she played varsity lacrosse. Research projects include "The Effects of Sleep on Pain Management", completed at the National Rehabilitation Hospital during residency. Further research and professional education are on-going.